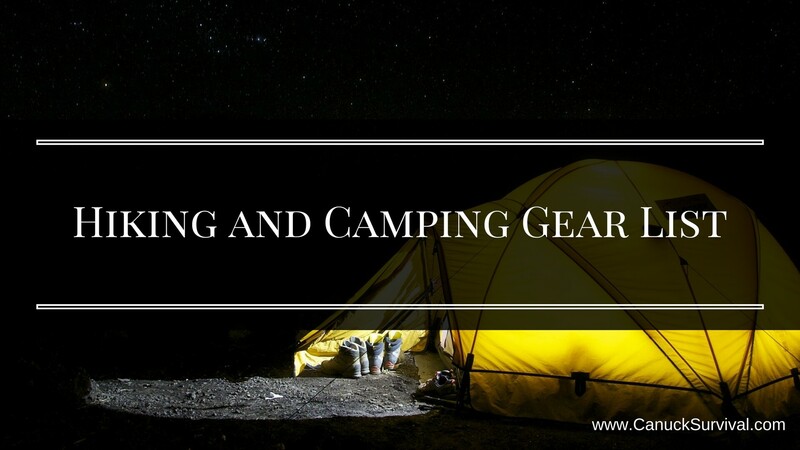 Here you’ll find a comprehensive hiking and camping gear list of the most common and popular items found throughout the hiking and camping communities. At the end of this article you’ll find all of the sources I’ve used to create this ultimate gear list. I’ve decided to use two lists, one for the basics and more skillful campers and hikers, and one for the beginners. In past articles I’ve talked about basic survival and building you BOB, but you also want to be prepared for a half-day, full-day, or multi-day hike and camping trip. This is a planned event, non-emergency situation, so you can make it enjoyable and comfortable for yourself, without having to take the whole house with you. Every list I’ve seen, and those you’ve probably already read, start with the 10 Essentials. There are also key to the Budget Friendly Bug Out Bag. TIP: There really is no difference from your BOB and ordinary hiking and camping bag. What you carry in your backpack will vary depending on season and location. Your environment will possibly be different from mine. Some areas may need a bug net, some not. You may need rain gear, you may not, etc. That’s why there is no perfect hiking and camping gear list, but there is the perfect standard camping and hiking list. Use it as a starting point then customize to your personal needs. Let’s start with the 10 Essentials. These are a must, even for a short 1/2 day hike. There you have it! yes, it’s that easy! The items you choose are up to you, and don’t be afraid to check out used gear or even borrow from a friend or rent from your local outdoor sporting goods store such as MEC. Over on the Camping and Hiking subreddit /u/cwcoleman has generated an amazing list for beginners on what to pack for your hiking and camping adventures. This will provide you with more comfort and enjoyment than the (bare minimum) 10 Essentials. Try to keep your kit under 30 pounds. Try on a pack before you buy, preferably with weight added. Don’t skimp out here as you’ll regret it with every step. Buy used, borrow, or rent. Cheap: Common blue tarp (found at hardware stores) plus rope and pegs. Probably not the best for beginners but it’s an option. There are way better tarps available and you could even make your own. Better: Lightweight tent. A tent will provide better shelter, comfort, privacy, and safety than a tarp. Not to mention setting it up requires much less skill than a tarp and rope. Other option: Some people swear by hammocks. This is something you can try to see if you like. Keep in mind they can be tricky and you need sturdy trees to attach to. Cheap: Ohuhu. Keep in mind that at this price point you really need to question the bag’s quality. EN rating is key in this category. Some makers put their own degree rating on their bags, while quality brands go with the official EN rating for comfort. Whatever you choose – treat it well because sleeping bags can be ruined by mis-handling. Cheapest: Garbage filled with dry leaves. Cheap: Use what you have or check out the local thrift shop or surplus store. You can grab these from your local dollar store. Cheap: DIY – band-aids, ibuprofen, Benadryl, and duct tape. Duct Tape – a few feet wrapped around a stick, trekking pole, Nalgene bottle, expired credit card, etc. Some suggest bringing 20-30′, just in case. Traction – Anti-slip cleats for the ice and snow. Food Cooler – Learn how to make your own here. Repair Kit – DIY, grab some duct tape, gear aid tape, Gore-Tex patch, spare buckle(s), etc. Batteries (backup) – Bring extra batteries for all your gear. Bear Bag + rope – any stuff sack or bag works. Knife – anything with a sharp edge. Could be a multi-tool, folding knife, or survival knife. I have the Light My Fire Mora Knife along with a Gerber Dime Micro Tool and folding knife I’ve owned for years. Umbrella – helps in a tarp shelter, sun protection, or non-windy wet days. Look for light and compact. Dry Bags – protecting clothes, tents, and sleeping bags. Sea-to-Summit is a popular brand. Pack cover / liner – heavy duty contractors garbage bag will work, or find a cover made for your backpack specifically. Have your own gear list you’d like to share, or suggestions for the readers? Leave a commend below! Thanks for reading! My wife and I are getting ready to go camping this weekend, so thanks for the helpful gear checklist. I like your point about bringing a repair kit with stuff like a knife and duct tape. You never know what equipment might break during the trip, so we’ll be sure to bring something like this just in case.